Buy These Macaroons You Should! Oh, Christ, I’m talking about the Hal Linden shower cap I wear! Obviously! I can’t believe you’d think that I was referring to– …What a bunch of perverts you people are! Anyway, like you, I enjoy I a good macaroon every now and again and so it being the Jewish Holy Week of Yomover, I think, there’s all kinds of good Jewish things to eat at your local grocery store – björksch, graffilti fish, pickled pigs feet, and, of course, macaroons! Oh, and great big bottles of Matzo-Bismol in case you get a schmertz in the mogn from eating all that good food during the cedar! Three-ninety-nine they want to charge you for these things?! Walgreens with your so-called “Hot Buys,” you should be ashamed! P’tooey! 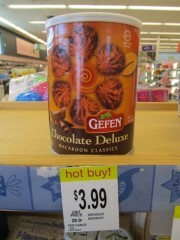 No, you want to get your macaroons at, where else?, the 99¢ Only Store! Because at the 99¢ Only Store, they’ve got macaroons for 99¢ Only. I bought like eight cannisters! Or, as they say in Yiddish, cannischewitzters! Sure, they’ll sit in your stomach like a rock if you eat them one after another like a chazzer, so save some for later. The 99¢ Only Store has just about every flavor and type available. Two varieties were even gluten-free, so I snatched them up quick – to prevent those who’ve bought into that whole allergic-to-gluten nonsense from being able to buy them. Most of the available macaroons, or ‘roons as we roonaphiles casually know them, are from the good people of Gefen Foods. I’m a traditionalist, so the Fancy Coconut Flavored Macaroons, or “regular,” were my favorite. Gefen’s Toffee Time Macaroon Classics were a delight as well, but seemed to lack any real toffee flavor that I could distinguish. Gefen’s Nutty Brownie Macaroon Classics were particularly wonderful, while their Fancy Honey-Nut Flavored Macaroons may or may not be just as good or better, but I haven’t opened that cannister yet. Stay tuned! 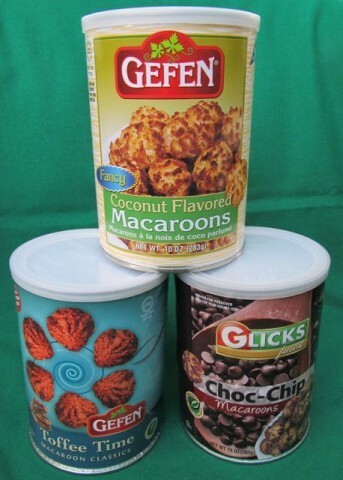 The other macaroonufacturer selling their wares at the 99¢ Only store is Glicks Foods. Their Glicks Finest Choc-Chip Macaroons are nice, but seemed a little stingy with actual chocolate chips. I don’t think it’s too much to expect at least one chip in each ‘roon, but sadly, that was not the case in my cannister. Would it have killed them to sprinkle a few extra chips in there? Oy! So there you have it – this Kippover buy your macaroons at the 99¢ Only Store and save, why not? Or is Mr. Big Shot with the fancy car and the nice clothes too good for the dollar store all of a sudden? Posted by Ted on April 7, 2012, 12:01 AM.